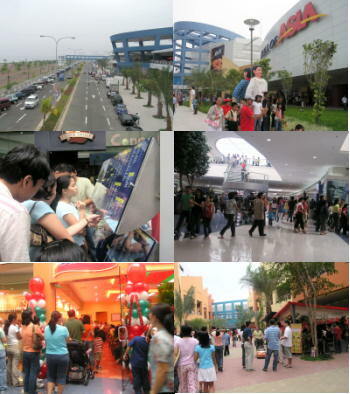 Last May 21, 2006 was the opening day of the SM Mall Of Asia, one giant mall divided into 4 buildings with lots of everything... food stores, clothing, entertainment, you name it, they got it. My folks and I decided to visit the mall. It's the first time I've visited a mall on its first day and I tell you, it's hell ! Of course everything is new so it's a new experience. But that's not really a plus. People didn't know which was where and how to get from point A to point B. We got lost inside and went in circles. You couldn't rely much on the janitors to direct you much less the other people since it was everybody's first day. I couldn't figure out their cryptic map of the mall either. To make matters worse, every restaurant and fastfood joint was jampacked due to the tremendous surge of people wanting to see the new mall for the very first time. This translated to long lines of hungry people. And to top it all, electricity fluctuated around this time forcing these restaurants to close and not accept people inside. That was a real bummer. This left a lot of hungry people angry and frustrated. I guess the mall didn't go through an trial or demo stage to simulate if the mall could handle the enormous demand for electricity. So we finally found a restaurant which did allow customers despite havin no electricity and so we ate in an unlit restaurant with the heat slowly picking up. Lastly, I hated their parking structure. You have 6 levels of parking for a 2 storey mall and so you need to go down from the parking to get to the mall. There are three elevators but it would take you years before you could get on one. Most of the people took the stairs but I should point out that this is torture for the unphysically fit and elderly. There were still lots of activities lined up for the day in the mall but we decided to call it a day at around mid afternoon and go home. We were so tired from walking in that huge mall. Everything is so far from one another. I don't think big is best. try ko nga pumunta...kailangan siguro matulog muna ako ng 8 hours para fully charged noh? naku, dapat may kadikit na hotel ang mall of asia... kasi kukulangin ang isang araw. at di tulad ng megamall, kung may gusto kang balikan, baka di mo na isipin pa dahil sa layo niya sa kung nasaan ka na. Of course initial reaction ko yan. Marami pang di bukas din. I guess I'll return in July. hehe, ganun ba..pwede bang mag camp out na lang..malaki naman ang reclamation area diba?